Kas Tempting, the fastest qualifier to the 2017 Sam Houston Futurity(G2), will face Texas Classic Futurity(G1) winner Thecartelofmiracle in the opening trial for the Sam Houston Derby (G3) on Friday. HOUSTON, TX—APRIL 10, 2018—A busy weekend at Sam Houston Race Park kicks off on Friday night with trials for the $191,900 Sam Houston Derby (G3). 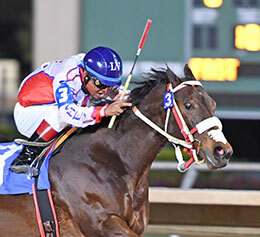 The Friday evening card will feature eight trials for the $191,900 Sam Houston Derby (G3). An array of talented juveniles and futurity champions will begin their 3-year-old campaign in the 350-yard trials. The first trial, to be run as the third race of the card, feature two standouts: Kas Tempting, the fastest qualifier to the 2017 Sam Houston Futurity and Thecartelofmiracle, who won the richest race in Texas, the $874,000 Texas Classic Futurity at Lone Star Park. Kas Tempting, a son of Tempting Dash owned by Garza Laurel Partnership, LLC, will be ridden by Eddie Sanchez. Thecartelofmiracle will reunite with Manny Gutierrez for Mauro Luciano Villarreal. The gelding by Tough and Good has already banked $419,359 in nine starts. Nymeria, winner of the $1.1 million Heritage Place Futurity runs in the second trial under Gutierrez. The filly by Bigtime Favorite is owned by Alfredo Garza and will be making her Sam Houston debut. The fourth trial will feature 2017 Sam Houston Futurity champion This Is An Eagle. The Texas-bred son of One Famous Eagle is owned by Mary Lynne Thompson and will be ridden by her regular pilot Francisco Calderon. Trainer Saul Ramirez, Jr. leads all conditioners with nine entrants; Adrian Huitron will saddle seven and Leon Bard, Abelardo Flores, Rodolfo Sanchez and Jorge Lopez have four 3-year-olds entered.